The frequent high-speed trains in China have caused the alarm of the motor vehicles to ring. Recently, a â€œhidden crackâ€ has cast a shadow on the high-speed rail that is deeply in the crisis of confidence. Exposure from the media â€œThe 7.1 mm long and 2.4 mm high cracks were found at the critical axis of the HSR train.â€ It has been reported for nearly a month. It is reported that the team of experts organized by the Ministry of Railways has long since ended and there is no official "Crack" and the results of the review responded. Recently, the reporter of â€œDaily Economic Newsâ€ obtained another explanation about cracks from a veteran who has long been engaged in railway quality and safety work: â€œcrackâ€ incident or â€œOolongâ€ caused by instability of flaw detection machine performance. "event. However, this news has not yet been confirmed by the relevant Ministry of Railways. According to the above-mentioned senior sources, the previously reported suspected â€œ7.1 mm long crackâ€ is actually the distance the probe moves in the axial direction of the axle, including the width of the sound field, and 2 mm is the depth of the defect from the outer surface of the axle. "In the review, when the crack detection machine detected the stability of the flaw detection machine, the difference in instability data of the flaw detection machine was found to be as high as 3dB to 6dB (decibels), and the 6dB reduction was 1.4mm in the defect size." People say. According to the technical conditions of the Ministry of Railways, hollow axles are not allowed to have more than 2mm equivalent material defects. If the flaw detection machine actually has 1.4mm instability data, it means that the equivalent defect of the original 2mm flat bottom hole is reflected in the flaw detection machine. The test results may be 0.6 mm, or 3.4 mm. If the veteran says it is true, it looks like an unusual machine "misdetection" behind, or hides a bigger security risk: the ability to misunderstand the power axis with no problem, which means that there may be problems due to errors. Power shaft. In this regard, the testing equipment provider Beijing New Railway Technology Development Co., Ltd. (hereinafter referred to as the new railway) refused to be interviewed and confirmed by reporters. Crack "Long 7.1 mm, high 2.4 mm" is a mistake? "Everybody who knows how to detect flaws knows that ultrasonic flaw detection is the detection of defects in the internal parts of a component. Cracks are one of a variety of defects. Even if flaw detection is detected by a flaw detector, it cannot be directly concluded that it is a crack." Senior people told the Daily Economic News reporter. A researcher at the Nondestructive Testing Laboratory of a third-party material research institute that did not wish to be named told reporters that when using an ultrasonic flaw detector to detect the presence of cracks, it mainly depends on the direction of sound velocity (including shear and longitudinal waves) and the orientation of defects. The production of â€œcrackâ€ conclusions generally needs to be verified theoretically and experimentally for the actual conditions of defects, test objects, etc., and undergo a series of corresponding reviews. Previously, it was reported that the Jinan Depot EMU had unclear defects on the key axis of the high-speed train on July 15. According to the inspection report at that time, the flaw was a crack, and it was 7.1 mm long and 2.4 mm high near the gear. The axle is a key component that connects the wheels of the column and has a major bearing on train safety. If there is a material defect of 2 mm or more than 2 mm in the power shaft, it will meet the standards of the Ministry of Railways for scrapping; if it is not scrapped, continued use may cause the vehicle to break the shaft and derail the vehicle. The above-mentioned senior figures stated that as a member of the railway system who has long been engaged in quality and safety work, he was also shocked after hearing of the â€œcrackâ€ incident. According to reports, the Ministry of Railways organized the Ministry of Railways to include technical personnel of competent bus personnel, axle manufacturers, inspection personnel of the vehicle operation department, technical personnel of the inspection machine equipment agency, and experts hired by the Ministry of Railways. Suspected cracks were reviewed. â€œAfter reviewing and comparing, we found that there were no cracks on the axles. It was previously reported that there were material defects inside the axles, and the size of the defects was within the standard range, which met the safety technical standards.â€ The above senior person told reporters. "The possible defects of new axles in general include: serious accumulation of inclusions, residual looseness, shrinkage holes, undercuts, forging cracks, heat treatment cracks, hairline, etc. The main defect of the axles in service is fatigue cracks." The senior person mentioned above. At present, the axles used by domestic EMU high-speed trains are hollow shafts. The purpose is to reduce the unsprung weight of the trains and improve the running quality. It is also conducive to extending the life of trains and axles. More importantly, the axles can be easily detected ultrasonically without disassembling the wheels. "In fact, all axles are defective. This is an inevitable result of metal parts. If it does not exceed a certain standard, it is safe," said another technician. It is understood that the hollow shaft used in the production process is a magnetic particle inspection and ultrasonic flaw detection, the daily detection of the operation stage uses ultrasonic testing methods. The Ministry of Railways requires that the hollow shaft be flawed every 30,000 kilometers of the CRH2 car, and the detection cycle of the CRH5 car is 180,000 kilometers. As of press time, there has been no official explanation of the "crack" incident and the results of the review. The above statement has not yet been confirmed. If it is a mistake, why not? Is it a device or a human factor? Or other factors? If the investigation is the cause of the equipment, why is the result not disclosed? Everything is in doubt. "Daily Economic News" reporter recently called the Ministry of Railways Product Quality Supervision and Inspection Center, Institute of Iron and Steel, the new railway and other units, the other refused to interview and consult. The above veteran explained that before the detection of the power axis, it is usually necessary to use a â€œstandard test blockâ€ for comparison, that is, the flaw detector first tests the standard hole of the test block axis, and the test result will be fed back to the flaw detector to generate a standard value. , and then use the standard value to determine whether the other axles tested are normal. 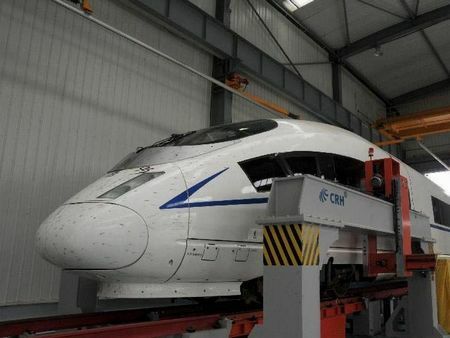 According to its disclosure, when testing the stability of the flaw detection machine that detected the â€œcrackâ€ before Jinanâ€™s trains, it took two â€œstandard test block axesâ€ of the same material and form for comparison. One of them was a moving axle and one of them was Trailer shaft, the detected data are all inconsistent, "found that the flaw detection data of this machine is up to 3dB ~ 6dB (decibels)." It is reported that the Jinan EMU uses the German-made flaw detection equipment provided by the new railroad, and the axle supplier Zhiqi Railway Equipment Co., Ltd. (hereinafter referred to as Zhiqi) uses equipment made in Italy. Previously, Zhiqi used Italian-made flaw detection equipment to review and compare the axle results, saying that the cause of the misunderstanding stemmed from the fact that the flaw detection machine came from two different manufacturers. The chief engineer of the white name responsible for the review once again denied to the Daily Economic News reporter. "Crack" statement. â€œThe reproducibility of currently used German hollow shaft ultrasonic flaw detectors is indeed worse than that of Italian-made flaw detectors, mainly due to the structure of their test arms and probe holders. The probe bars are not smooth, they are not well-moved, and they are sometimes moved. Lagging, leading to poor coupling of the scan, the sensitivity of instability." The senior said. However, the German new flaw detection equipment provider before the re-examination of their equipment is very confident, insisting that the detection of material defects or manufacturing defects, the details will be separately reported to the Ministry of Railways. It also pointed out that not only Jinan, but also other places of the motor car have found similar problems. In this regard, CNR (4.51, 0.01, 0.22%) has been insisting to reporters that it has never replaced an axle. After the â€œcrackâ€ review, the new railway refused to accept the reporterâ€™s confirmation for the exposure of the informed person. However, the technical personnel of the flaw detection room of the CSR Qishuyan Locomotive & Rolling Stock Technology Research Institute told the reporter that the flaw detection equipment is a system. Any abnormality in one aspect of the probe, coupling, etc. will affect the flaw detection effect. "So, before using a flaw detector, it will perform daily performance verification, and if it finds problems, it will not be used. Therefore, unstable conditions will not generally exist. Even if equipment abnormality (unstable) is detected during the inspection process, the waveform is also It will be abnormal, and experienced operators should terminate it in time," said the CSR technician mentioned above. The above-mentioned veteran said that before reviewing the expert group, it was found that when the inspection machine was calibrated, the instability data was found to be 3 dB to 6 dB (decibels). New Rail: "Exclusive supplier" of the flaw detection machine of the Ministry of Railways? When the â€œcrackâ€ incident was first exposed, some media had questioned Zhiqi, the sole supplier of the current domestic axle. Because of its monopoly, the actual controller Ding Shumiao was a key figure in the case of Liu Zhijun, former minister of the Ministry of Railways. . According to industry observations, the new supplier of the main flaw detection machine has a history of interesting play. "Daily Economic News" reporter learned from the inquiry of the Beijing Industry and Commerce Bureau that the new railway was established in 1997 with a registered capital of 10 million yuan and legal representative Wang Zhiquan. In the past 14 years, little has been reported about the operating results of the new railway. The most recent report was the "Zhongguancun (6.46, 0.01, 0.16%) policy guarantees gave birth to 15 GEM companies at the end of 2010." It mentioned that it was relying on the fist product "EMU hollow shaft ultrasonic flaw detection system," the new railway. The annual output value has soared from RMB 30 million three years ago to the current RMB 450 million. It is currently preparing for listing. It is understood that the new iron core hollow shaft flaw detection equipment is a technical cooperation with Germany and Japan. The engineers of CSR Qishuyan Locomotive and Rolling Technology Research Institute told the reporter that the main flaws that can be detected on the hollow shaft in the world are the brands of Germany, Italy, and Japan, especially the former two. â€œDaily Economic Newsâ€ reporters learned from CNR, CSR, Zhiqi and other manufacturing companies that they are using Italian flaw detection machines. However, according to a number of industry insiders, the train system, train sections and some railways in the railway system have been confirmed. The inspection and repair department uses mostly German flaw detectors. As to why the manufacturing units and the railway bureaus used different instruments, they all said "not very clear." According to reports, the new iron is one of the domestic manufacturers who have mastered hollow shaft ultrasonic flaw detection technology and can automatically detect 0.35 mm wide cracks. In 2006, several sets of ultrasonic flaw detection systems were ordered by railway departments in Beijing and Shanghai, followed by orders. From 2008 to 2010, the new railway received a credit line of 30 million yuan, 70 million yuan, and 100 million yuan from the Zhongguancun Science and Technology Guarantee Co., Ltd., and its profits have soared from 990,000 yuan in 2007 to 13 million yuan in 2009. Increased by more than 10 times. From this point of view, the new railway is not only a representative of policy-based guarantee companies to support the development and expansion of SMEs, but also one of the private enterprises that has made a fortune due to the rapid expansion of China's high-speed rail. Senior people said that the use of different methods and different equipment for a product quality inspection is an effective means to ensure product quality. However, if the flaw detection machine continues to be used if it is found to be a problem, misidentification at the same time means that it is also possible to let go of the quality problem. This will be very dangerous. The reporter recently went to the business registration address of the new railway company, Room 410, Huifuxuan, Building 1, No.11, Slope Street, Gaoliangqiao, Haidian District, Beijing. This is a relatively old ordinary residential rental house located in the residential building opposite Beijing Jiaotong University. Property officials said that the new Union Railway had indeed worked here but had moved away last year. Afterwards, the reporter found the new office of the new railway company not far from the old office address at Changhewan Facade Store. The company was very low-key. At the entrance of the transparent glass window on the first floor, it was difficult to find any signboard with the company name. . Recently, the official website of the new railway has also been in an "online upgrade" and cannot be opened properly. The reporter inquired on the website of the Ministry of Railways that the â€œList of Railway Construction Projects for A Controlled Materials and Equipmentâ€ reissued in January this year (Tie Jiantou (2010) No. 163) stated that the â€œhollow shaft flaw detection equipmentâ€ was used by the EMU. Inspection and inspection equipment was listed among them, and the notice required that A control of the equipment be tendered and purchased within the scope of qualified suppliers. The so-called "a supply of materials" means that a certain material or object is provided by Party A (that is, the customer itself). "A control material" is a material or item specified by Party A and must be purchased by Party B. "The hollow shaft inspection "The equipment" belongs to the "A for A" material equipment. According to people in the industry, it is "very simple" to obtain a "private A" company qualified by the Ministry of Railways. In June 2010, in the recruiting information of a well-known university, the new railway impressively wrote that it was the â€œexclusive supplierâ€ of the hollow shaft ultrasonic flaw detection system of the EMU of the Ministry of Railways, and also the outer skin cleaning of the EMU repair equipment of the Ministry of Railways. Machine's "exclusive supplier." Because the new railway refused to be interviewed, the reporter failed to positively verify the above information. Ultrasonic flaw detection has strong professionalism and high technical content. If it has never been involved before 2007, it will become the only manufacturer of the hollow shaft ultrasonic flaw detection machine of the EMU of the Ministry of Railways in 2010. It will also be able to supply such unstable testing equipment. People in the industry and outside of doubt and thinking.